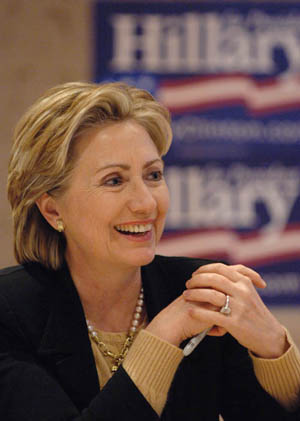 Hillary Clinton is a US Senator and wife to former president Bill Clinton. She has an amazingly strong character and determination and has been a leader amongst Washington D.C. politicians for years, even prior to her role as First Lady. She fought a tough battle against Barrack Obama for the Democratic Nominee - but didn't take the cake. Barack would have been much better off had he chosen Hillary as a Vice Presidential running mate - but he went for Biden who basically told him that he wasn't qualified when in the nominee campaign. Hillary isn't going to run for president or become eligible for a write-in vote - but she would have mine if she would. Out of the users that have visited this site 1653 out of 65123 say they would write in Hillary Clinton if they knew the write in would help get him elected for president. (Not every candidate is registered/eligible for write in votes in every state). 65 million strong and we all write her in in 2020; we are a force collectively, we will NOT be swayed by all other nay-sayers who continue to slander her. It's fake news!